"The National Gallery invites visitors to experience the key works of Paolo Veronese; one of the most significant, influential and beautiful painters of the Venetian Renaissance, in the first monographic show on the artist to be held in the United Kingdom. 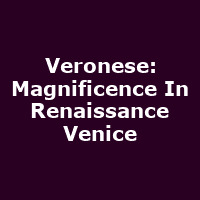 The National Gallery owns ten paintings by Veronese and these will be displayed next to other major works by the artist which have been loaned by European and American museums to form a display of about 50 works. These will offer visitors the opportunity to enjoy his magnificent visions such as 'The Family of Darius before Alexander' and the 'Allegories of Love'; a series of four paintings which each concentrate on a specific aspect - 'Unfaithfulness', 'Scorn', 'Respect' and 'Happy Union'."